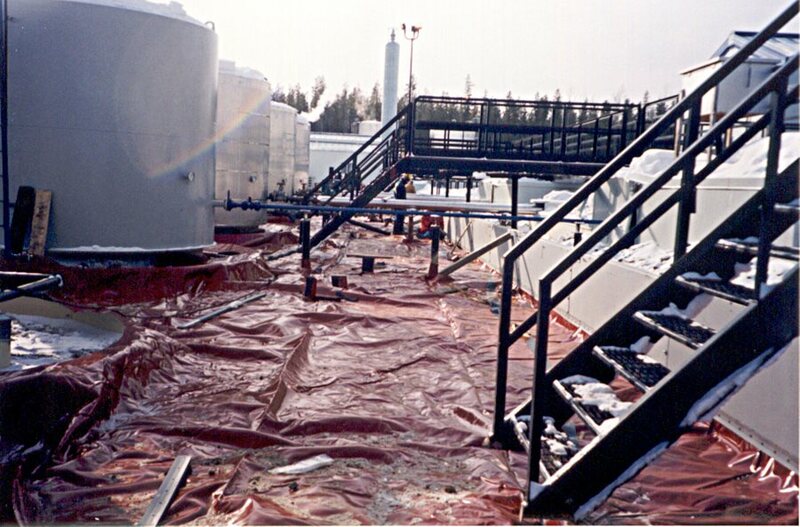 Secondary containment of petroleum fuels and liquids is a Layfield specialty. We have a complete line of geomembrane materials available to contain all types of petroleum liquids. We can assist with the selection of a geomembrane for your particular application and have design assistance available to help you with the details. We fabricate geomembranes to size for all containment sizes and we supply complete installation services for larger projects. We provide many types of geomembrane for petroleum products including Enviro Liner materials for oilfield containments, HAZGARD materials for commercial products, and High Temperature materials for oil sands and heavy oil facilities. We also supply specialty items such as E Berm steel containment wall systems and spray-on lining systems. Our installation crews are trained to work in gas plants, refineries, and commercial installations so that we can supply your lining requirements in any application.